We don’t always get excited about updates to Facebook. In fact, multiple changes in succession can be frustrating (example: we weren’t crazy about them banning advertising gun-related products or services). However, Facebook just issued an update we’re excited about and we want to tell you why YOU should be excited as well! In February, Facebook announced it was beginning to roll out new multi-product Facebook ads. This is a feature with amazing potential and we’re going to encourage many of our clients to test it as soon as possible. 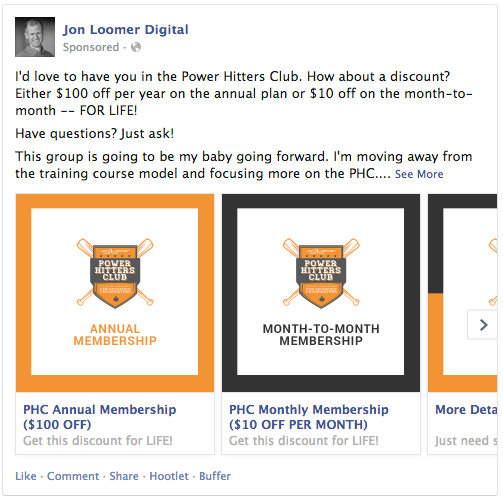 What are Multi-Product Facebook Ads? These ads are currently only available in the form of Website Click ads, but what better way to drive traffic to your site than to offer a potential visitor more than one reason to engage with your content? Imagine an ad that begins with a link to an informative blog post and ends with a request for donations? This is something we’ve never been able to do with Facebook ads! And it gets better, Facebook will optimize your ads to display the ones that are receiving the most engagement first, which means less money and better returns for you. We’re really excited about using this new product to create super effective ads for our clients. If you’re interested in reaching a larger and more engaged group of Facebook followers, or you’re just curious to learn more about multi-product ads, just reply back to this email and we’ll be happy to help! © 2019 Vici Media All Rights Reserved.